HMX – your eco-friendly cooling expert! For more than 15 years, HMX has provided effective, reliable and cost-effective cooling solutions for varied industries around the country. As of today, with over 45 million CFM all over India – HMX has the world’s largest installed base of indirect evaporative cooling. We cool over 9 million square feet of area in a variety of industries – each installation of which has different process conditions and heat loads – with a combination of the below technologies. DAMA: The core technology of HMX is the next-generation DAMA heat exchanger. DAMA stands for ’Dry Air and Moist Air’. The DAMA heat exchanger is a cross-flow, plate-type polymeric exchanger. The design of the heat exchanger is highly optimised to deliver the best heat exchanger performance without sacrificing its strength and stability. Warm, primary air flows in enclosed channels and gives up its heat to water films flowing down the other side of the polymeric plates. A secondary air stream flowing in the direction opposite to the water, evaporates water before it is exhausted outside. Thus, the primary air is cooled without any moisture addition. Primary air is cooled sensibly with a heat exchanger, while the secondary air carries away the heat energy from the primary air as generated vapour. Water evaporates directly into the air stream, thus reducing the air temperature while humidifying the air. 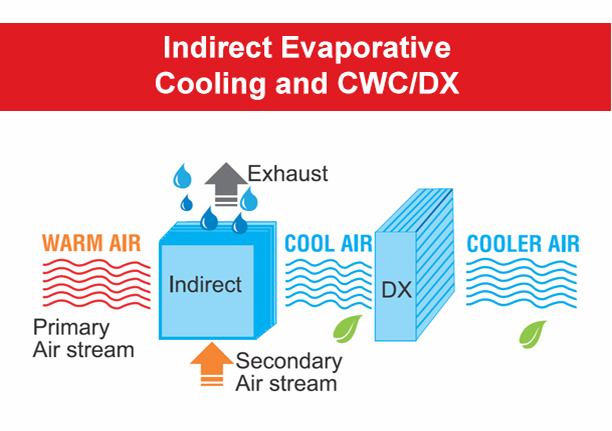 With indirect/direct evaporative cooling, the primary air stream is cooled first with indirect evaporative cooling and then cooled further with direct evaporative cooling. 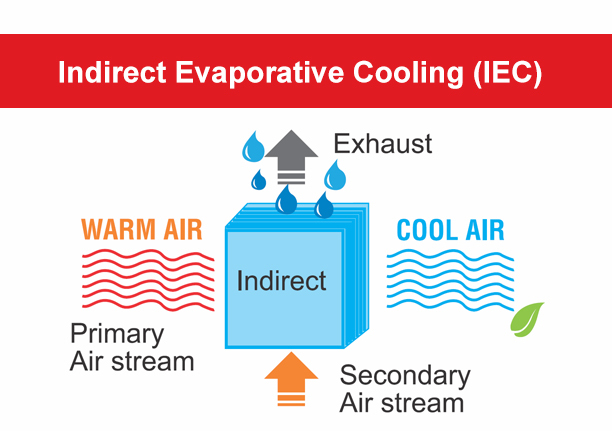 The primary air stream is cooled first with indirect evaporative cooling. This cools the primary air stream to the desired temperature. When more cooling is required, the supplemental CWC/DX achieves the desired temperature. 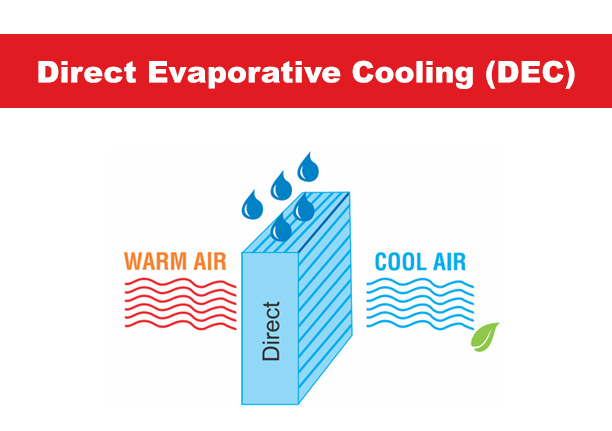 What is Indirect Evaporative Cooling? 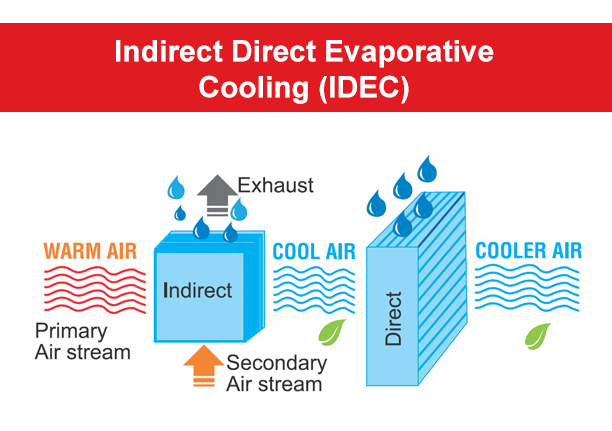 Indirect Evaporative Cooling (IEC) has the potential to bring in a revolutionary change in the field of comfort conditioning. In IEC, warm primary air cools by losing its heat to a thin water film on the other side of a conducting surface. Another air stream then evaporates this water, thereby, converting most of the sensible heat into latent heat, before it is exhausted to the outside. Thus, the primary air is cooled without coming in contact with the water stream. Hence, IEC reduces the dry bulb temperature, wet-bulb temperature and the enthalpy of the primary air without adding any moisture to it. We’re proud to call ourselves ‘doctors of fresh air’. HMX provides comfort cooling solutions in places where the ambient temperature varies throughout the year. The HMX-Ambiator can maintain the temperature between 24-28°C for 98% of the year. HMX has installed such systems in organisations such as Volkswagen and Bosch. By providing pre-cooled and filtered fresh air to buildings, with an existing air conditioning system in place, we help customers reduce their energy costs by reducing the heat load on air conditioning as well as the tonnage of air conditioning required. HMX has successfully installed such systems in organisations such as Syntel, Infosys and others. Some manufacturing processes have specific requirements of maintaining temperature and humidity within a certain range. This type of climate control is essential in maintaining certain parameters such as temperature and/or humidity within narrow, pre-defined range for the end product. HMX has provided such solutions to organisations such as ITC and Coca Cola. Fresh and cool air is a mandatory requirement in specific sections of a factory where heat generation is higher than in other sections. These hot ‘pockets’ show a temperature difference of as much as 8-10°C as compared to other areas. HMX has successfully designed and installed such systems for SKF and Tata Motors, among many others. 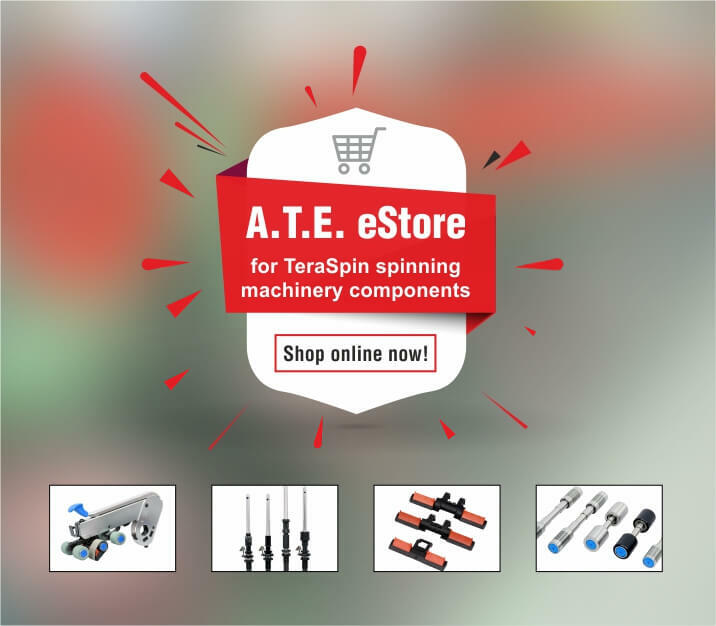 Our constant endeavour is to evolve with the changing needs of our customers and provide engineered solutions using our state-of-the-art technology. We provide turnkey solutions including consultation on design, supply and installation and commissioning right from conceptualisation to completion.